Review for Blanchard Online, WARNING!!! I sold back 40 silver coins I purchased from Blanchard several years ago.What I did not know was that I would have to wait 3 or 4 weeks to receive my check.Why? 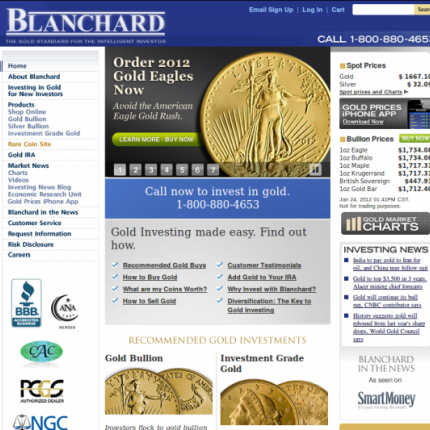 Because the customer rep says that "Blanchard"must first sell the coins before I get paid! Never again will I do business with Blanchard.There are numerous other precious metal dealers online whom will pay you by wire or check within 2 business days after receiving your shipment.Never,ever,sell to Blanchard!!! As a new coin investor I was foolish to trust Blanchard Account Executive for honest answers to my questions and an ethical approach to coin transactions. After purchasing over $20K worth of coins over 5 years ago, I was dismayed to discover that I was "ripped off" and grossly overpaid. I have since dealt with Money Metals Exchange and have been greatly impressed by their advice, ethics and transparency. I will never do business with Blanchard and am surprised they continue to remain in business.